Only 3 warlords remain and they need to fight it out to be the best. This is an enchanting 5 reel of ancient value and includes priests, samurais and barbarians who will stop at nothing to reach success. Crystals of Power is also a video-based online slot game which means that there is fun and exciting graphics to enjoy between each and every spin on this casino slots online game, giving you the full online gaming experience at it's best, this wonderful creation will have you gripped for hours on end. Play today! Recently NetEnt has celebrated its 20th anniversary, and in that time, they have become one of the most searched for online software providers in the iGaming industry. To understand how they have stayed on top of the game for so long, you just need to look at their impressive gaming portfolio, where each game features sophisticated and innovative designs, exciting bonus features, cash prizes and dozens of Free Spins and Multipliers. Players love NetEnt games, which is why in 2006 they were voted as one of the top 20 online casino modules. There are loads of other NetEnt games available for you to enjoy at slot games. Warlords: Crystals of Power is an epic online slot game where you are given the rare opportunity to conquer the world. Fusing the mystery of medieval warriors and Hollywood showmanship, you will embark on a fierce battle for the ultimate prize, will you emerge as the one to beat all others? This epic 5 reel, 30 pay line slot game can be played from 15p up to £150 per spin, which gives anyone the chance to conquer the world. The story centres around three mighty rulers, The Barbarian, The Priestess and The Samurai, who after many years of war have finally come together for a final battle to become the ultimate ruler. These rulers will appear stacked on the reels. You will also see Wolves, Panthers, Warthogs, and 3 Coloured Masks decorating the reels. The highest value symbols are the Samurai and the Wild, which is the 3 Crystals of Power symbol. Each will reward you with a 20x times your stake when you land 5 on a pay line. The Wild symbol will substitute for all symbols except the Scatter. There are also plenty of bonus features to keep you entertained! The Random Overlay Wild feature can trigger randomly during any spin in the main game. This is played on a different set of reels with no Scatters, each ruler will give you Wilds to add to your winning combinations. There are 3 Scatter symbols, the Hammer, Arrow and Sword. 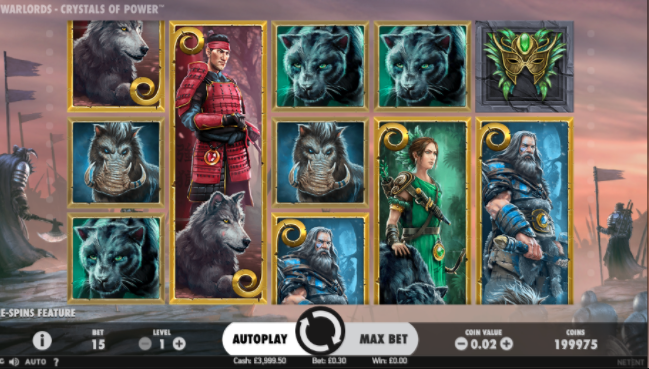 The Blue Scatter will trigger the Barbarian Free Spins, the Green will reward you with the Priestess Free Spins and the Red with the Samurai Free Spins feature. If you get different Scatters it will trigger a Battle between the 3 rulers to decide what Free Spins feature you get. The Barbarian Free Spins feature rewards you with 9 free spins and the chance to retrigger more free spins in the feature. You could win up to 600 times your stake in this bonus feature. The Samurai Free Spins feature gives you 5 free spins with Scatter symbols that act like Sticky Wilds. You could also win up to 600 times your stake in this feature. The Priestess Free Spins feature rewards you with 7 free spins, and Scatter symbols that increase the multipliers by x1 for each one that appears. You can also retrigger the free spins, which means you have the potential of winning 6, 666x times your bet! what are you waiting for?play slot games online now.